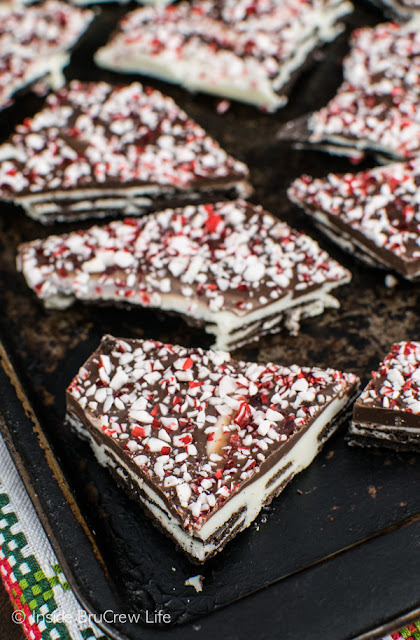 Everyone appreciates recipes that are fast this time of year.This bark is beautiful and would make a great gift and is sure to be a welcome addition to holiday feasting! Line an 11x15 pan with foil. Spread a little bit of white chocolate on the back of the cookies and lay flat on the foil lined paper. Continue until all the cookies are laying flat and side by side. Spread the rest of the white chocolate over the top of the cookies using a flat spatula. Drop the chocolate by spoonfuls over the top. Swirl gently until you get the pattern you like. Sprinkle with peppermint bits. Let set. Use a large knife to cut the chocolate into pieces. Store in a sealed container.